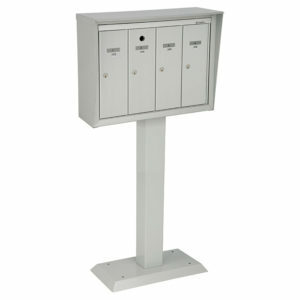 Placed on a pedestal, the parcel box can accomodate mail items too large to fit in a regular compartment. Provided with a key return slot, this model is made for exterior purposes. Perfect for receiving parcels at home or at the office. Natural anodized aluminum finish #628. The sides and the back are made of aluminum and painted grey. 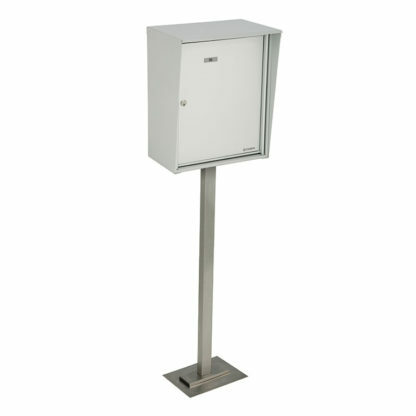 As an outdoor solution, this model is placed on a pedestal and is ideal for small residential apartment buildings. Meet Canada Post’s standards. 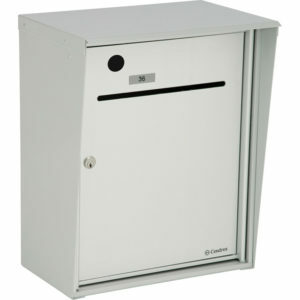 The wall mounted parcel box comes with a mail slot where individuals can deposit their mail. Also, Canada Post can retrieve the items using a master lock located in the front of the parcel box. Ideal for small companies and small apartment buildings.